Energy Service Companies (ESCO) have become pioneers in the development of financing and operating models for various energy sector customers. Every two years, the so-called Contracting Award highlights exemplary ESCO projects in Germany (“Contracting” is the German word for Energy Service Contracts). 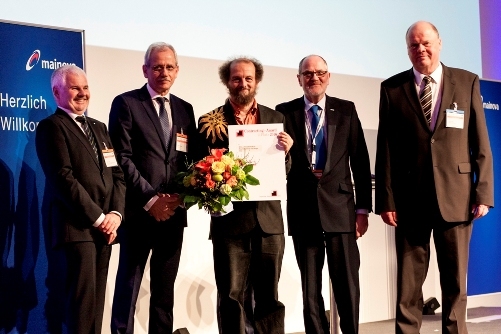 For the first time since the launch of the awards in 1997, the jury members from the magazine Energy & Management and the German Heat & Power Association, AGFW, presented one of these awards to a solar thermal ESCO. On 16 April, Christian Holter (third from left), Managing Director of Austrian turnkey system supplier S.O.L.I.D., was presented with the second prize for its solar energy supply contract with a district heating company in the Austrian city of Graz. The company published Tech Sheets and Fact Sheets about ESCO models as part of the IEA’s Solar Heating and Cooling programme’s Task 45, Large Scale Solar Heating and Cooling Systems (see the attached documents). According to a May 2015 survey, S.O.L.I.D. was the second largest solar thermal ESCO in terms of collector area under contract (13 solar heating and cooling systems totalling 26,427 m²). The largest one was Pampa Elvira Solar in Chile, which has been operating a 39,300 m² solar process heat installation at a copper mine since October 2013. Prestige (standing out from one’s competitors, showing openness to new technologies). EPC is a form of creative financing for capital improvement which allows funding energy upgrades from cost reductions. Under an EPC arrangement an external organisation (ESCO) implements a project to deliver energy efficiency, or a renewable energy project, and uses the stream of income from the cost savings, or the renewable energy produced, to repay the costs of the project, including the costs of the investment. Essentially the ESCO will not receive its payment unless the project delivers energy savings as expected. The ESCO is the central component of the business model, dealing with the turnkey system supplier, attracting financing, and operating and maintaining the system (see the following diagram). The customer is the one signing the Energy Service Contract with the ESCO. The Tech Sheet describes two variations of the EPC model: If capital is provided by third-party financing, the client will also have to pay a deposit directly to the outside investor. The other frequently used type of ESCO model is Heat Delivery Contracting (HDC), which means that the ESCO takes over complete responsibility for providing the client with an agreed-upon range of energy services (e.g., space heat, lighting, etc.) including primary energy purchase. It is an extreme form of energy management outsourcing. Putz said that although the Energy Service Directive mandated Member States to remove market barriers and stimulate the energy service market by May 2008, there was still a lack of implementation in several countries. Part of the Tech Sheet is an overview of ESCO market barriers in EU Member States based on research carried out in 2011 in the framework of EU project BioSolESCO. 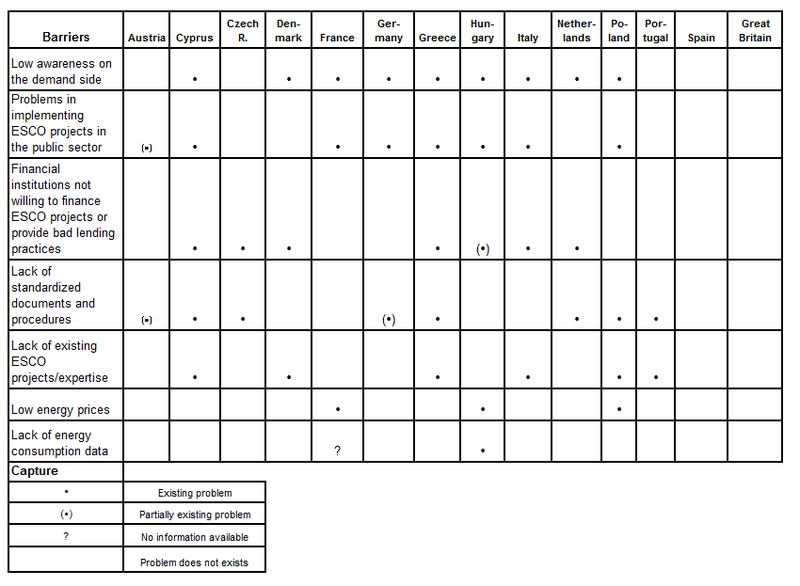 These research efforts were focused on analysing barriers of biomass and solar thermal ESCO projects (see the attached table).